The Treaty of Versailles (French: Traité de Versailles) was the most important of the peace treaties that brought World War I to an end. The Treaty ended the state of war between Germany and the Allied Powers. It was signed on 28 June 1919 in Versailles, exactly five years after the assassination of Archduke Franz Ferdinand, which had directly led to World War I. The other Central Powers on the German side of World War I signed separate treaties. Although the armistice, signed on 11 November 1918, ended the actual fighting, it took six months of Allied negotiations at the Paris Peace Conference to conclude the peace treaty. The treaty was registered by the Secretariat of the League of Nations on 21 October 1919. On 28 June 1914 the Bosnian-Serbs assassinated the heir to the throne of Austria-Hungary in the name of Serbian nationalism. This caused a rapidly escalating July Crisis resulting in Austria-Hungary declaring war on Serbia, followed quickly by the entry of most European powers into First World War. Two alliances faced off, the Central Powers (led by Germany) and the Triple Entente (led by Britain, France and Russia). Other countries entered as fighting ranged widely across Europe, as well as the Middle East, Africa and Asia. In 1917, two revolutions occurred within the Russian Empire. The new Bolshevik government under Vladimir Lenin in March 1918 signed the Treaty of Brest-Litovsk that was highly favourable to Germany. Sensing victory before American armies could be ready, Germany now shifted forced to the Western Front and tried to overwhelm the Allies. It failed. Instead the Allies won decisively on the battlefield and forced an armistice in November 1918 that resembled a surrender. On 6 April 1917, the United States entered the war against the Central Powers. The motives were twofold: German submarine warfare against merchant ships trading with France and Britain, which led to the sinking of the RMS Lusitania and the loss of 128 American lives; and the interception of the German Zimmermann Telegram, urging Mexico to declare war against the United States. The American war aim was to detach the war from nationalistic disputes and ambitions after the Bolshevik disclosure of secret treaties between the Allies. The existence of these treaties tended to discredit Allied claims that Germany was the sole power with aggressive ambitions. On 8 January 1918, President Woodrow Wilson issued the nation's postwar goals, the Fourteen Points. It outlined a policy of free trade, open agreements, and democracy. While the term was not used self-determination was assumed. It called for a negotiated end to the war, international disarmament, the withdrawal of the Central Powers from occupied territories, the creation of a Polish state, the redrawing of Europe's borders along ethnic lines, and the formation of a League of Nations to guarantee the political independence and territorial integrity of all states. It called for a just and democratic peace uncompromised by territorial annexations. The Fourteen Points were based on the research of the Inquiry, a team of about 150 advisors led by foreign-policy advisor Edward M. House, into the topics likely to arise in the expected peace conference. After the Central Powers launched Operation Faustschlag on the Eastern Front, the new Soviet Government of Russia signed the Treaty of Brest-Litovsk with Germany on 3 March 1918. This treaty ended the war between Russia and the Central powers and annexed 1,300,000 square miles (3,400,000 km2) of territory and 62 million people. This loss equated to a third of the Russian population, a quarter of its territory, around a third of the country's arable land, three-quarters of its coal and iron, a third of its factories (totalling 54 percent of the nation's industrial capacity), and a quarter of its railroads. During the autumn of 1918, the Central Powers began to collapse. Desertion rates within the German army began to increase, and civilian strikes drastically reduced war production. On the Western Front, the Allied forces launched the Hundred Days Offensive and decisively defeated the German western armies. Sailors of the Imperial German Navy at Kiel mutinied, which prompted uprisings in Germany, which became known as the German Revolution. The German government tried to obtain a peace settlement based on the Fourteen Points, and maintained it was on this basis that they surrendered. Following negotiations, the Allied powers and Germany signed an armistice, which came into effect on 11 November while German forces were still positioned in France and Belgium. The terms of the armistice called for an immediate evacuation of German troops from occupied Belgium, France, and Luxembourg within fifteen days. In addition, it established that Allied forces would occupy the Rhineland. In late 1918, Allied troops entered Germany and began the occupation. Both the German Empire and Great Britain were dependent on imports of food and raw materials, primarily from the Americas, which had to be shipped across the Atlantic Ocean. The Blockade of Germany (1914–1919) was a naval operation conducted by the Allied Powers to stop the supply of raw materials and foodstuffs reaching the Central Powers. The German Kaiserliche Marine was mainly restricted to the German Bight and used commerce raiders and unrestricted submarine warfare for a counter-blockade. The German Board of Public Health in December 1918 stated that 763,000 German civilians had died during the Allied blockade, although an academic study in 1928 put the death toll at 424,000 people. Talks between the Allies to establish a common negotiating position started on 18 January 1919, in the Salle de l'Horloge at the French Foreign Ministry on the Quai d'Orsay in Paris. Initially, 70 delegates from 27 nations participated in the negotiations. Russia was excluded due to their signing of a separate peace (the Treaty of Brest-Litovsk) and early withdrawal from the war. Furthermore, German negotiators were excluded to deny them an opportunity to divide the Allies diplomatically. Initially, a "Council of Ten" (comprising two delegates each from Britain, France, the United States, Italy, and Japan) met officially to decide the peace terms. This council was replaced by the "Council of Five", formed from each countries foreign ministers, to discuss minor matters. 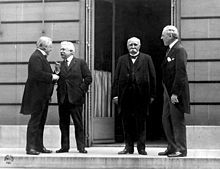 Prime Minister of France Georges Clemenceau, Prime Minister of Italy Vittorio Emanuele Orlando, Prime Minister of the United Kingdom David Lloyd George, and President of the United States Woodrow Wilson formed the "Big Four" (at one point becoming the "Big Three" following the temporally withdrawal of Vittorio Emanuele Orlando). These four men met in 145 closed sessions to make all the major decisions, which were later ratified by the entire assembly. The minor powers attended a weekly "Plenary Conference" that discussed issues in a general forum but made no decisions. These members formed over 50 commissions that made various recommendations, many of which were incorporated into the final text of the treaty. France had lost 1.3 million soldiers, including 25% of French men aged 18–30 and 400,000 civilians. France had also been more physically damaged than any other nation (the so-called zone rouge (Red Zone); the most industrialized region and the source of most coal and iron ore in the north-east had been devastated and in the final days of the war mines had been flooded and railways, bridges and factories destroyed. Clemenceau intended to ensure the security of France, by weakening Germany economically, militarily, territorially and by supplanting Germany as the leading producer of steel in Europe. A position British economist and Versailles negotiator John Maynard Keynes summarized as attempting to "set the clock back and undo what, since 1870, the progress of Germany had accomplished." Clemenceau told Wilson: "America is far away, protected by the ocean. Not even Napoleon himself could touch England. You are both sheltered; we are not". The French wanted a frontier on the Rhine, to protect France from a German invasion and compensate for French demographic and economic inferiority. American and British representatives refused the French claim and after two months of negotiations, the French accepted a British pledge to provide an immediate alliance with France if Germany attacked again, and Wilson agreed to put a similar proposal to the Senate. Clemenceau had told the Chamber of Deputies, in December 1918, that his goal was to maintain an alliance with both countries. Clemenceau accepted the offer, in return for an occupation of the Rhineland for fifteen years and that Germany would also demilitarise the Rhineland. French negotiators required reparations, to make Germany pay for the destruction induced throughout the war and to decrease German strength. The French also wanted the iron ore and coal of the Saar Valley, by annexation to France. The French were willing to accept a smaller amount of reparations than the Americans would concede and Clemenceau was willing to discuss German capacity to pay with the German delegation, before the final settlement was drafted. In April and May 1919, the French and Germans held separate talks, on mutually acceptable arrangements on issues like reparation, reconstruction and industrial collaboration. France, along with the British Dominions and Belgium, opposed mandates and favored annexation of former German colonies. Britain had suffered little land devastation during the war. However, the British wartime coalition was re-elected during the so-called Coupon election at the end of 1918, with a policy of squeezing the German "'til the pips squeak". 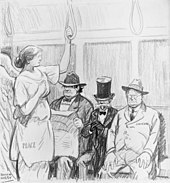 Public opinion favoured a "just peace", which would force Germany to pay reparations and be unable to repeat the aggression of 1914, although those of a "liberal and advanced opinion" shared Wilson's ideal of a peace of reconciliation. In private Lloyd George opposed revenge and attempted to compromise between Clemenceau's demands and the Fourteen Points, because Europe would eventually have to reconcile with Germany. Lloyd George wanted terms of reparation that would not cripple the German economy, so that Germany would remain a viable economic power and trading partner. 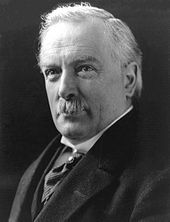 By arguing that British war pensions and widows' allowances should be included in the German reparation sum, Lloyd George ensured that a large amount would go to the British Empire. Lloyd George also intended to maintain a European balance of power to thwart a French attempt to establish itself as the dominant European power. A revived Germany would be a counterweight to France and a deterrent to Bolshevik Russia. Lloyd George also wanted to neutralize the German navy to keep the Royal Navy as the greatest naval power in the world; dismantle the German colonial empire with several of its territorial possessions ceded to Britain and others being established as League of Nations mandates, a position opposed by the Dominions. Prior to the American entry into the war, Wilson had talked of a 'peace without victory'. This position fluctuated following the US entry into the war. Wilson spoke of the German aggressors, with whom there could be no compromised peace. However, on 8 January 1918, Wilson delivered a speech (known as the Fourteen Points) that declared the American peace objectives: the rebuilding of the European economy, self-determination of European ethnic groups, the promotion of free trade, the creation of appropriate mandates for former colonies, and above all, the creation of a powerful League of Nations that would ensure the peace. The aim of the latter was to provide a forum to revise the peace treaties as needed, and deal with problems that arose as a result of the peace and the rise of new states. Wilson brought along top intellectuals as advisors to the American peace delegation, and the overall American position echoed the Fourteen Points. Wilson firmly opposed harsh treatment on Germany. While the British and French wanted to largely annex the German colonial empire, Wilson saw that as a violation of the fundamental principles of justice and human rights of the native populations, and favored them having the right of self-determination via the creation of mandates. The promoted idea called for the major powers to act as disinterested trustees over a region, aiding the native populations until they could govern themselves. In spite of this position and in order to ensure that Japan did not refuse to join the League of Nations, Wilson favored turning over the former German colony of Shandong, in Eastern China, to Japan rather than return the area to Chinese control. Further confounding the Americans, was US internal partisan politics. In November 1918, the Republican Party won the Senate election by a slim margin. Wilson, a Democrat, refused to include prominent Republicans in the American delegation making his efforts seem partisan, and contributed to a risk of political defeat at home. In June 1919, the Allies declared that war would resume if the German government did not sign the treaty they had agreed to among themselves. The government headed by Philipp Scheidemann was unable to agree on a common position, and Scheidemann himself resigned rather than agree to sign the treaty. Gustav Bauer, the head of the new government, sent a telegram stating his intention to sign the treaty if certain articles were withdrawn, including Articles 227, 230 and 231. [nb 1] In response, the Allies issued an ultimatum stating that Germany would have to accept the treaty or face an invasion of Allied forces across the Rhine within 24 hours. On 23 June, Bauer capitulated and sent a second telegram with a confirmation that a German delegation would arrive shortly to sign the treaty. On 28 June 1919, the fifth anniversary of the assassination of Archduke Franz Ferdinand (the immediate impetus for the war), the peace treaty was signed. The treaty had clauses ranging from war crimes, the prohibition on the merging of Austria with Germany without the consent of the League of Nations, freedom of navigation on major European rivers, to the returning of a Koran to the king of Hedjaz. 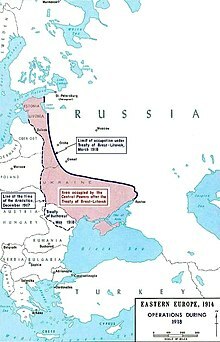 The treaty stripped Germany of 25,000 square miles (65,000 km2) of territory and 7 million people. It also required Germany to give up the gains made via the Treaty of Brest-Litovsk and grant independence to the protectorates that had been established. 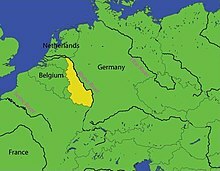 In Western Europe Germany was required to recognize Belgian sovereignty over Moresnet and cede control of the Eupen-Malmedy area. Within six months of the transfer, Belgium was required to conduct a plebiscite on whether the citizens of the region wanted to remain under Belgian sovereignty or return to German control, communicate the results to the League of Nations and abide by the League's decision. To compensate for the destruction of French coal mines, Germany was to cede the output of the Saar coalmines to France and control of the Saar to the League of Nations for 15 years; a plebiscite would then be held to decide sovereignty. The treaty "restored" the provinces of Alsace-Lorraine to France by rescinding the treaties of Versailles and Frankfurt of 1871 as they pertained to this issue. The sovereignty of Schleswig-Holstein was to be resolved by a plebiscite to be held at a future time (see Schleswig Plebiscites). In Central Europe Germany was to recognize the independence of Czechoslovakia and cede parts of the province of Upper Silesia. Germany had to recognize the independence of Poland and renounce "all rights and title over the territory". Portions of Upper Silesia were to be ceded to Poland, with the future of the rest of the province to be decided by plebiscite. The border would be fixed with regard to the vote and to the geographical and economic conditions of each locality. The province of Posen (now Poznań), which had come under Polish control during the Greater Poland Uprising, was also to be ceded to Poland. Pomerelia (Eastern Pomerania), on historical and ethnic grounds, was transferred to Poland so that the new state could have access to the sea and became known as the Polish Corridor. The sovereignty of part of southern East Prussia was to be decided via plebiscite while the East Prussian Soldau area, which was astride the rail line between Warsaw and Danzig, was transferred to Poland outright without plebiscite. An area of 51,800 square kilometres (20,000 square miles) was granted to Poland at the expense of Germany. Memel was to be ceded to the Allied and Associated powers, for disposal according to their wishes. Germany was to cede the city of Danzig and its hinterland, including the delta of the Vistula River on the Baltic Sea, for the League of Nations to establish the Free City of Danzig. Article 119 of the treaty required Germany to renounce sovereignty over former colonies and Article 22 converted the territories into League of Nations mandates under the control of Allied states. Togoland and German Kamerun (Cameroon) were transferred to France. Ruanda and Urundi were allocated to Belgium, whereas German South-West Africa went to South Africa and the United Kingdom obtained German East Africa. As compensation for the German invasion of Portuguese Africa, Portugal was granted the Kionga Triangle, a sliver of German East Africa in northern Mozambique. Article 156 of the treaty transferred German concessions in Shandong, China, to Japan, not to China. Japan was granted all German possessions in the Pacific north of the equator and those south of the equator went to Australia, except for German Samoa, which was taken by New Zealand. The treaty was comprehensive and complex in the restrictions imposed upon the post-war German armed forces (the Reichswehr). 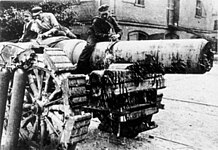 The provisions were intended to make the Reichswehr incapable of offensive action and to encourage international disarmament. Germany was to demobilize sufficient soldiers by 31 March 1920 to leave an army of no more than 100,000 men in a maximum of seven infantry and three cavalry divisions. The treaty laid down the organisation of the divisions and support units, and the General Staff was to be dissolved. Military schools for officer training were limited to three, one school per arm, and conscription was abolished. Private soldiers and non-commissioned officers were to be retained for at least twelve years and officers for a minimum of 25 years, with former officers being forbidden to attend military exercises. To prevent Germany from building up a large cadre of trained men, the number of men allowed to leave early was limited. The number of civilian staff supporting the army was reduced and the police force was reduced to its pre-war size, with increases limited to population increases; paramilitary forces were forbidden. The Rhineland was to be demilitarized, all fortifications in the Rhineland and 50 kilometres (31 miles) east of the river were to be demolished and new construction was forbidden. Military structures and fortifications on the islands of Heligoland and Düne were to be destroyed. Germany was prohibited from the arms trade, limits were imposed on the type and quantity of weapons and prohibited from the manufacture or stockpile of chemical weapons, armoured cars, tanks and military aircraft. The German navy was allowed six pre-dreadnought battleships and was limited to a maximum of six light cruisers (not exceeding 6,000 long tons (6,100 t)), twelve destroyers (not exceeding 800 long tons (810 t)) and twelve torpedo boats (not exceeding 200 long tons (200 t)) and was forbidden submarines. The manpower of the navy was not to exceed 15,000 men, including manning for the fleet, coast defences, signal stations, administration, other land services, officers and men of all grades and corps. The number of officers and warrant officers was not allowed to exceed 1,500 men. Germany surrendered eight battleships, eight light cruisers, forty-two destroyers, and fifty torpedo boats for decommissioning. Thirty-two auxiliary ships were to be disarmed and converted to merchant use. Article 198 prohibited Germany from having an air force, including naval air forces, and required Germany to hand over all aerial related materials. In conjunction, Germany was forbidden to manufacture or import aircraft or related material for a period of six months following the signing of the treaty. In Article 231 Germany accepted responsibility for the losses and damages caused by the war "as a consequence of the ... aggression of Germany and her allies. "[nb 2] The treaty required Germany to compensate the Allied powers, and it also established an Allied "Reparation Commission" to determine the exact amount which Germany would pay and the form that such payment would take. The commission was required to "give to the German Government a just opportunity to be heard", and to submit its conclusions by 1 May 1921. In the interim, the treaty required Germany to pay an equivalent of 20 billion gold marks ($5 billion) in gold, commodities, ships, securities or other forms. The money would help to pay for Allied occupation costs and buy food and raw materials for Germany. To ensure compliance, the Rhineland and bridgeheads east of the Rhine were to be occupied by Allied troops for fifteen years. If Germany had not committed aggression, a staged withdrawal would take place; after five years, the Cologne bridgehead and the territory north of a line along the Ruhr would be evacuated. After ten years, the bridgehead at Coblenz and the territories to the north would be evacuated and after fifteen years remaining Allied forces would be withdrawn. If Germany reneged on the treaty obligations, the bridgeheads would be reoccupied immediately. 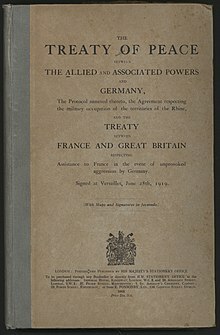 Part I of the treaty, as per all the treaties signed during the Paris Peace Conference,[nb 3] was the Covenant of the League of Nations, which provided for the creation of the League, an organization for the arbitration of international disputes. Part XIII organized the establishment of the International Labour Officer, to regulate hours of work, including a maximum working day and week; the regulation of the labour supply; the prevention of unemployment; the provision of a living wage; the protection of the worker against sickness, disease and injury arising out of his employment; the protection of children, young persons and women; provision for old age and injury; protection of the interests of workers when employed abroad; recognition of the principle of freedom of association; the organization of vocational and technical education and other measures. The treaty also called for the signatories to sign or ratify the International Opium Convention. The delegates of the Commonwealth and British Government had mixed thoughts on the treaty, with some seeing the French policy as being greedy and vindictive. Lloyd George and his private secretary Philip Kerr believed in the treaty, although they also felt that the French would keep Europe in a constant state of turmoil by attempting to enforce the treaty. 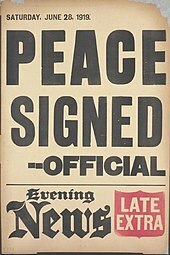 Delegate Harold Nicolson wrote "are we making a good peace? ", while General Jan Smuts (a member of the South African delegation) wrote to Lloyd-George, before the signing, that the treaty was unstable and declared "Are we in our sober senses or suffering from shellshock? What has become of Wilson's 14 points?" He wanted the Germans not be made to sign at the "point of the bayonet". Smuts issued a statement condemning the treaty and regretting that the promises of "a new international order and a fairer, better world are not written in this treaty". Lord Robert Cecil said that many within the Foreign Office were disappointed by the treaty. The treaty received widespread approval from the general public. Bernadotte Schmitt wrote that the "average Englishman ... thought Germany got only what it deserved" as a result of the treaty. However, public opinion changed as German complaints mounted. The surrendering of the German High Seas Fleet following the armistice, its internment, and eventual scuttling at Scapa Flow meant that Britain's primary war goal was achieved prior to the signing of the treaty. As a result, British policy towards Germany began diverging from France's almost from the moment the guns fell silent and focused on establishing Germany as a bulwark against the threat posed by the new Soviet Union. By the 1930s, Lloyd George's position on the treaty has changed. In 1938, he published his memoir titled The Truth About the Peace Treaties, in which he repudiated the terms of the treaty that bore his signature. Prime Minister Ramsay MacDonald, following the German re-militarisation of the Rhineland in 1936, stated that he was "pleased" that the treaty was "vanishing", expressing his hope that the French had been taught a "severe lesson". The signing of the treaty was met with roars of approval, singing, and dancing from a crowd outside the Palace of Versailles. 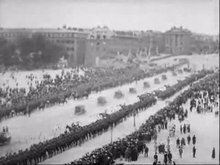 In Paris proper, people rejoiced at the official end of the war, the return of Alsace and Lorraine to France, and that Germany had agreed to pay reparations. While France ratified the treaty and was active in the League, the jubilant mood soon gave way to a political backlash for Clemenceau. The French Right saw the treaty as being too lenient and saw it as failing to achieve all of France's demands. Left-wing politicians attacked the treaty and Clemenceau for being too harsh (the latter turning into a ritual condemnation of the treaty, for politicians remarking on French foreign affairs, as late as August 1939). Marshal Ferdinand Foch stated "this (treaty) is not peace. It is an armistice for twenty years. "; a criticism over the failure to annex the Rhineland and for compromising French security for the benefit of the United States and Britain. When Clemenceau stood for election as President of France in January 1920, he was defeated. Portugal entered the war on the Allied side in 1916 primarily to ensure the security of its African colonies, which were threatened with seizure by both Britain and Germany. To this extent, she succeeded in her war aims. The treaty recognized Portuguese sovereignty over these areas and awarded her small portions of Germany's bordering overseas colonies. Otherwise, Portugal gained little at the peace conference. Her promised share of German reparations never materialized, and a seat she coveted on the executive council of the new League of Nations went instead to Spain—which had remained neutral in the war. In the end, Portugal ratified the treaty, but got little out of the war, which cost more than 8,000 Portuguese troops and as many as 100,000 of her African colonial subjects their lives. After the Versailles conference, Democratic President Woodrow Wilson claimed that "at last the world knows America as the savior of the world!" However, the Republican Party, led by Henry Cabot Lodge, controlled the US Senate after the election of 1918, and the senators were divided into multiple positions on the Versailles question. It proved possible to build a majority coalition, but impossible to build a two-thirds coalition that was needed to pass a treaty. A discontent bloc of 12–18 "Irreconcilables", mostly Republicans but also representatives of the Irish and German Democrats, fiercely opposed the treaty. One block of Democrats strongly supported the Versailles Treaty, even with reservations added by Lodge. A second group of Democrats supported the treaty but followed Wilson in opposing any amendments or reservations. The largest bloc, led by Senator Lodge, comprised a majority of the Republicans. They wanted a treaty with reservations, especially on Article 10, which involved the power of the League of Nations to make war without a vote by the US Congress. All of the Irreconcilables were bitter enemies of President Wilson, and he launched a nationwide speaking tour in the summer of 1919 to refute them. However, Wilson collapsed midway with a serious stroke that effectively ruined his leadership skills. The closest the treaty came to passage was on 19 November 1919, as Lodge and his Republicans formed a coalition with the pro-Treaty Democrats, and were close to a two-thirds majority for a Treaty with reservations, but Wilson rejected this compromise and enough Democrats followed his lead to permanently end the chances for ratification. Among the American public as a whole, the Irish Catholics and the German Americans were intensely opposed to the treaty, saying it favored the British. After Wilson's presidency, his successor Republican President Warren G. Harding continued American opposition to the formation of the League of Nations. Congress subsequently passed the Knox–Porter Resolution bringing a formal end to hostilities between the United States and the Central Powers. It was signed into law by President Harding on 2 July 1921. Soon after, the US–German Peace Treaty of 1921 was signed in Berlin on 25 August 1921, and two similar treaties were signed with Austria and Hungary on 24 and 29 August 1921, in Vienna and Budapest respectively. I am leaving Paris, after eight fateful months, with conflicting emotions. Looking at the conference in retrospect, there is much to approve and yet much to regret. It is easy to say what should have been done, but more difficult to have found a way of doing it. To those who are saying that the treaty is bad and should never have been made and that it will involve Europe in infinite difficulties in its enforcement, I feel like admitting it. But I would also say in reply that empires cannot be shattered, and new states raised upon their ruins without disturbance. To create new boundaries is to create new troubles. The one follows the other. While I should have preferred a different peace, I doubt very much whether it could have been made, for the ingredients required for such a peace as I would have were lacking at Paris. Many in China felt betrayed as the German territory in China was handed to Japan. Wellington Koo refused to sign the treaty and the Chinese delegation at the Paris Peace Conference was the only nation that did not sign the Treaty of Versailles at the signing ceremony. The sense of betrayal led to great demonstrations in China like the May 4th movement and the fall of the nascent Chinese Republic's government[when?] and poisoned relations with the West. There was immense dissatisfaction with Duan Qirui’s government, which had secretly negotiated with the Japanese in order to secure loans to fund their military campaigns against the south. On 29 April, the German delegation under the leadership of the Foreign Minister Ulrich Graf von Brockdorff-Rantzau arrived in Versailles. On 7 May, when faced with the conditions dictated by the victors, including the so-called "War Guilt Clause", von Brockdorff-Rantzau replied to Clemenceau, Wilson and Lloyd George: "We know the full brunt of hate that confronts us here. You demand from us to confess we were the only guilty party of war; such a confession in my mouth would be a lie." 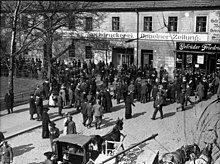 Because Germany was not allowed to take part in the negotiations, the German government issued a protest against what it considered to be unfair demands, and a "violation of honour", soon afterwards withdrawing from the proceedings of the peace conference. After Scheidemann's resignation, a new coalition government was formed under Gustav Bauer. President Friedrich Ebert knew that Germany was in an impossible situation. Although he shared his countrymen's disgust with the treaty, he was sober enough to consider the possibility that the government would not be in a position to reject it. He believed that if Germany refused to sign the treaty, the Allies would invade Germany from the west—and there was no guarantee that the army would be able to make a stand in the event of an invasion. With this in mind, he asked Field Marshal Paul von Hindenburg if the army was capable of any meaningful resistance in the event the Allies resumed the war. If there was even the slightest chance that the army could hold out, Ebert intended to recommend against ratifying the treaty. Hindenburg—after prodding from his chief of staff, Wilhelm Groener—concluded the army could not resume the war even on a limited scale. However, rather than inform Ebert himself, he had Groener inform the government that the army would be in an untenable position in the event of renewed hostilities. Upon receiving this, the new government recommended signing the treaty. The National Assembly voted in favour of signing the treaty by 237 to 138, with five abstentions (there were 421 delegates in total). This result was wired to Clemenceau just hours before the deadline. Foreign minister Hermann Müller and colonial minister Johannes Bell travelled to Versailles to sign the treaty on behalf of Germany. The treaty was signed on 28 June 1919 and ratified by the National Assembly on 9 July by a vote of 209 to 116. Conservatives, nationalists and ex-military leaders condemned the treaty. Politicians of the Weimar Republic who supported the treaty, socialists, communists, and Jews were viewed with suspicion as persons of questionable loyalty. It was rumored that Jews had not supported the war and had played a role in selling Germany out to its enemies. Those who seemed to benefit from a weakened Germany and the newly formed Weimar Republic were regarded as having "stabbed Germany in the back". Those who instigated unrest and strikes in the critical military industries on the home front or who opposed German nationalism were seen to have contributed to Germany's defeat. These theories were given credence by the fact that when Germany surrendered in November 1918, its armies were still on French and Belgian territory. Furthermore, on the Eastern Front, Germany had already won the war against Russia and concluded the Treaty of Brest-Litovsk. In the West, Germany had seemed to have come close to winning the war with the Spring Offensive earlier in 1918. Its failure was blamed on strikes in the arms industry at a critical moment of the offensive, leaving soldiers with an inadequate supply of materiel. The strikes were regarded by nationalists as having been instigated by traitors, with the Jews taking most of the blame. 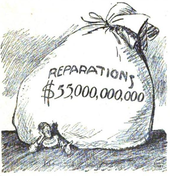 On 5 May 1921, the reparation Commission established the London Schedule of Payments and a final reparation sum of 132 billion gold marks to be demanded of all the Central Powers. This was the public assessment of what the Central Powers combined could pay, and was also a compromise between Belgian, British, and French demands and assessments. Furthermore, the Commission recognized that the Central Powers could pay little and that the burden would fall upon Germany. As a result the sum was split into different categories, of which Germany was only required to pay 50 billion gold marks (US$12.5 billion); this being the genuine assessment of the Commission on what Germany could pay, and allowed the Allied powers to save face with the public by presenting a higher figure. Furthermore, payments made between 1919 and 1921 were taken into account reducing the sum to 41 billion gold marks. In order to meet this sum, Germany could pay in cash or kind: coal, timber, chemical dyes, pharmaceuticals, livestock, agricultural machines, construction materials, and factory machinery. Germany's assistance with the restoration of the university library of Louvain, which was destroyed by the Germans on 25 August 1914, was also credited towards the sum. Territorial changes imposed by the treaty were also factored in. The payment schedule required US$250 million within twenty-five days and then US$500 million annually, plus 26 per cent of the value of German exports. The German Government was to issue bonds at five per cent interest and set up a sinking fund of one per cent to support the payment of reparations. In February and March 1920, the Schleswig Plebiscites were held. The people of Schleswig were presented with only two choices: Danish or German sovereignty. The northern Danish-speaking area voted for Denmark while the southern German-speaking area voted for Germany, resulting in the province being partitioned. The East Prussia plebiscite was held on 11 July 1920. There was a 90% turn out with 99.3% of the population wishing to remain with Germany. Further plebiscites were held in Eupen, Malmedy, and Prussian Moresnet. On 20 September 1920, the League of Nations allotted these territories to Belgium. These latter plebiscites were followed by a boundary commission in 1922, followed by the new Belgian-German border being recognized by the German Government on 15 December 1923. The transfer of the Hultschin area, of Silesia, to Czechoslovakia was completed on 3 February 1921. Following the implementation of the treaty, Upper Silesia was initially governed by Britain, France, and Italy. Between 1919 and 1921, three major outbreaks of violence took place between German and Polish civilians, resulting in German and Polish military forces also becoming involved. In March 1921, the Inter-Allied Commission held the Upper Silesia plebiscite, which was peaceful despite the previous violence. The plebiscite resulted in c. 60 per cent of the population voting for the province to remain part of Germany. Following the vote, the League of Nations debated the future of the province. In 1922, Upper Silesia was partitioned: Oppeln, in the north-west, remained with Germany while Silesia Province, in the south-east, was transferred to Poland. Memel remained under the authority of the League of Nations, with a French military garrison, until January 1923. On 9 January 1923, Lithuanian forces invaded the territory during the Klaipėda Revolt. The French garrison withdrew, and in February the Allies agreed to attach Memel as an "autonomous territory" to Lithuania. On 8 May 1924, after negotiations between the Lithuanian Government and the Conference of Ambassadors and action by the League of Nations, the annexation of Memel was ratified. Lithuania accepted the Memel Statute, a power-sharing arrangement to protect non-Lithuanians in the territory and its autonomous status while responsibility for the territory remained with the great powers. The League of Nations mediated between the Germans and Lithuanians on a local level, helping the power-sharing arrangement last until 1939. On 13 January 1935, 15 years after the Saar Basin had been placed under the protection of the League of Nations, a plebiscite was held to determine the future of the area. 528,105 votes were cast, with 477,119 votes (90 per cent of the ballot) in favour of union with Germany; 46,613 votes were cast for the status quo, and 2,124 votes for union with France. The region returned to German sovereignty on 1 March 1935. When the result was announced 4,100 people, including 800 refugees from Germany fled to France. In late 1918, American, Belgian, British, and French troops entered the Rhineland to enforce the armistice. Prior to the treaty, the occupation force stood at roughly 740,000 men. Following the signing of the peace treaty, the numbers drastically decreased and by 1926 the occupation force numbered only 76,000 men. As part of the 1929 negotiations that would become the Young Plan, Stresemann and Aristide Briand negotiated the early withdrawal of Allied forces from the Rhineland. 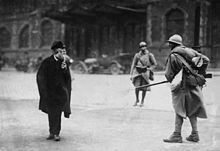 On 30 June 1930, after speeches and the lowering of flags, the last troops of the Anglo-French-Belgian occupation force withdrew from Germany. Belgium maintained an occupation force of roughly 10,000 troops throughout the initial years. This figure fell to 7,102 by 1926, and continued to fall as a result of diplomatic developments. The British Second Army, with some 275,000 veteran soldiers, entered Germany in late 1918. In March 1919, this force became the British Army of the Rhine (BAOR). The total number of troops committed to the occupation rapidly dwindled as veteran soldiers were demobilized, and were replaced by inexperienced men who had finished basic training following the cessation of hostilities. By 1920, the BAOR consisted of only 40,594 men and the following year had been further reduced to 12,421. The size of the BAOR fluctuated over the following years, but never rose above 9,000 men. The British did not adhere to all obligated territorial withdrawals as dictated by Versailles, on account of Germany not meeting her own treaty obligations. A complete withdrawal was considered, but rejected in order to maintain a presence to continue acting as a check on French ambitions and prevent the establishment of an autonomous Rhineland Republic. The French Army of the Rhine was initially 250,000 men strong, including at a peak 40,000 African colonial troops (Troupes coloniales). By 1923, the French occupation force had decreased to roughly 130,000 men, including 27,126 African troops. The troop numbers peaked again at 250,000 during the occupation of the Ruhr, before decreasing to 60,000 men by 1926. Germans viewed the use of French colonial troops as a deliberate act of humiliation, and used their presence to create a propaganda campaign dubbed the Black shame. This campaign lasted throughout the 1920s and 30s, although peaked in 1920 and 1921. For example, a 1921 German Government memo detailed 300 acts of violence from colonial troops, which included 65 murders and 170 sexual offenses. Historical consensus is that the charges were exaggerated for political and propaganda purposes, and that the colonial troops behaved far better than their white counterparts. An estimated 500–800 Rhineland Bastards were born as a result of fraternization between colonial troops and German women, and whom would latter be persecuted. The United States Third Army entered Germany with 200,000 men. In June 1919, the Third Army demobilized and by 1920 the US occupation force had been reduced to 15,000 men. Wilson further reduced the garrison to 6,500 men, prior to the inauguration of Warren G. Harding in 1921. On 7 January 1923, after the Franco–Belgian occupation of the Ruhr, the US senate legislated the withdrawal of the remaining force. On 24 January, the American garrison started their withdrawal from the Rhineland, with the final troops leaving in early February. The German economy was so weak that only a small percentage of reparations was paid in hard currency. Nonetheless, even the payment of this small percentage of the original reparations (132 billion gold marks) still placed a significant burden on the German economy. Although the causes of the devastating post-war hyperinflation are complex and disputed, Germans blamed the near-collapse of their economy on the treaty, and some economists estimated that the reparations accounted for as much as one-third of the hyper-inflation. In March 1921, French and Belgian troops occupied Duisburg, which formed part of the demilitarized Rhineland, according to the Treaty of Versailles. In January 1923, French and Belgian forces occupied the rest of the Ruhr area as a reprisal after Germany failed to fulfill reparation payments demanded by the Versailles Treaty. The German government answered with "passive resistance", which meant that coal miners and railway workers refused to obey any instructions by the occupation forces. Production and transportation came to a standstill, but the financial consequences contributed to German hyperinflation and completely ruined public finances in Germany. Consequently, passive resistance was called off in late 1923. The end of passive resistance in the Ruhr allowed Germany to undertake a currency reform and to negotiate the Dawes Plan, which led to the withdrawal of French and Belgian troops from the Ruhr Area in 1925. In 1920, the head of the Reichswehr Hans von Seeckt clandestinely re-established the General Staff, by expanding the Truppenamt (Troop Office); purportedly a human resources section of the army. In March, 18,000 German troops entered the Rhineland under the guise of attempting to quell possible unrest by communists and in doing so violated the demilitarized zone. In response, French troops advanced further into Germany until the German troops withdrew. The Weimar Government also funded domestic rearmament programs, which were covertly funded with the money camouflaged in "X-budgets", worth up to an additional 10% of the disclosed military budget. By 1925, German companies had begun to design tanks and modern artillery. During the year, over half of Chinese arms imports were German and worth 13 million Reichsmarks. In January 1927, following the withdrawal of the Allied disarmament committee, Krupps ramped up production of armor plate and artillery. [nb 5] Production increased so that by 1937, military exports had increased to 82,788,604 Reichsmarks. Production was not the only violation: "Volunteers" were rapidly passed through the army to make a pool of trained reserves, and paramilitary organizations were encouraged with the illegally militarized police. Non-commissioned officers (NCOs) were not limited by the treaty, thus this loophole was exploited and as such the number of NCOs were vastly in excess to the number needed by the Reichswehr. In December 1931, the Reichswehr finalized a second rearmament plan that called for 480 million Reichsmarks to be spent over the following five years: this program sought to provide Germany the capability of creating and supplying a defensive force of 21 divisions supported by aircraft, artillery, and tanks. This coincided with a 1 billion Reichsmark programme that planned for additional industrial infrastructure that would be able to permanently maintain this force. As these programs did not require an expansion of the military, they were nominally legal. On 7 November 1932, the Reich Minister of Defense Kurt von Schleicher authorized the illegal Umbau Plan for a standing army of 21 divisions based on 147,000 professional soldiers and a large militia. Later in the year at the World Disarmament Conference, Germany withdrew to force France and the United Kingdom to accept German equality of status. The United Kingdom attempted to get Germany to return with the promise of all nations maintaining an equality in armaments and security. The British later proposed and agreed to an increase in the Reichswehr to 200,000 men, and for Germany to have an air force half the size of the French. It was also negotiated for the French Army to be reduced. In October 1933, following the rise of Adolf Hitler and the founding of Nazi regime, Germany withdrew from League of Nations and the World Disarmament Conference. In March 1935, Germany reintroduced conscription followed by an open rearmament programme, the official unveiling of the Luftwaffe (air force), and signed the Anglo-German Naval Agreement that allowed a surface fleet 35% of the size of the Royal Navy. The resulting rearmament programs was allotted 35 billion Reichsmarks over an eight-year period. On 7 March 1936, German troops entered and remilitarized the Rhineland. 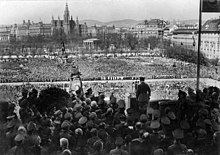 On 12 March 1938, following German pressure to the collapse the Austrian Government, German troops crossed into Austria and the following day Hitler announced the Anschluss: the annexation of Austria by Germany. The following year, on 23 March 1939, Germany annexed Memel from Lithuania. According to David Stevenson, since the opening of French archives, most commentators have remarked on French restraint and reasonableness at the conference, though Stevenson notes that "[t]he jury is still out", and that "there have been signs that the pendulum of judgement is swinging back the other way." In his book The Economic Consequences of the Peace, John Maynard Keynes referred to the Treaty of Versailles as a "Carthaginian peace", a misguided attempt to destroy Germany on behalf of French revanchism, rather than to follow the fairer principles for a lasting peace set out in President Woodrow Wilson's Fourteen Points, which Germany had accepted at the armistice. He stated: "I believe that the campaign for securing out of Germany the general costs of the war was one of the most serious acts of political unwisdom for which our statesmen have ever been responsible." 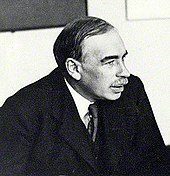 Keynes had been the principal representative of the British Treasury at the Paris Peace Conference, and used in his passionate book arguments that he and others (including some US officials) had used at Paris. He believed the sums being asked of Germany in reparations were many times more than it was possible for Germany to pay, and that these would produce drastic instability. French economist Étienne Mantoux disputed that analysis. During the 1940s, Mantoux wrote a posthumously published book titled The Carthaginian Peace, or the Economic Consequences of Mr. Keynes in an attempt to rebut Keynes' claims. More recently economists have argued that the restriction of Germany to a small army saved it so much money it could afford the reparations payments. It has been argued (for instance by historian Gerhard Weinberg in his book A World at Arms) that the treaty was in fact quite advantageous to Germany. 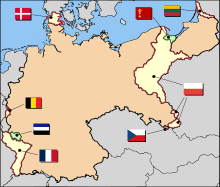 The Bismarckian Reich was maintained as a political unit instead of being broken up, and Germany largely escaped post-war military occupation (in contrast to the situation following World War II). In a 1995 essay, Weinberg noted that with the disappearance of Austria-Hungary and with Russia withdrawn from Europe, that Germany was now the dominant power in Eastern Europe. The British military historian Correlli Barnett claimed that the Treaty of Versailles was "extremely lenient in comparison with the peace terms that Germany herself, when she was expecting to win the war, had had in mind to impose on the Allies". Furthermore, he claimed, it was "hardly a slap on the wrist" when contrasted with the Treaty of Brest-Litovsk that Germany had imposed on a defeated Russian SFSR in March 1918, which had taken away a third of Russia's population (albeit mostly of non-Russian ethnicity), one-half of Russia's industrial undertakings and nine-tenths of Russia's coal mines, coupled with an indemnity of six billion marks. Eventually, even under the "cruel" terms of the Treaty of Versailles, Germany′s economy had been restored to its pre-war status. Barnett also claims that, in strategic terms, Germany was in fact in a superior position following the Treaty than she had been in 1914. Germany′s eastern frontiers faced Russia and Austria, who had both in the past balanced German power. Barnett asserts that its post-war eastern borders were safer, because the former Austrian Empire fractured after the war into smaller, weaker states, Russia was wracked by revolution and civil war, and the newly restored Poland was no match for even a defeated Germany. In the West, Germany was balanced only by France and Belgium, both of which were smaller in population and less economically vibrant than Germany. Barnett concludes by saying that instead of weakening Germany, the treaty "much enhanced" German power. Britain and France should have (according to Barnett) "divided and permanently weakened" Germany by undoing Bismarck's work and partitioning Germany into smaller, weaker states so it could never have disrupted the peace of Europe again. By failing to do this and therefore not solving the problem of German power and restoring the equilibrium of Europe, Britain "had failed in her main purpose in taking part in the Great War". The British historian of modern Germany, Richard J. Evans, wrote that during the war the German right was committed to an annexationist program which aimed at Germany annexing most of Europe and Africa. Consequently, any peace treaty that did not leave Germany as the conqueror would be unacceptable to them. Short of allowing Germany to keep all the conquests of the Treaty of Brest-Litovsk, Evans argued that there was nothing that could have been done to persuade the German right to accept Versailles. Evans further noted that the parties of the Weimar Coalition, namely the Social Democratic Party of Germany (SPD), the social liberal German Democratic Party (DDP) and the Christian democratic Centre Party, were all equally opposed to Versailles, and it is false to claim as some historians have that opposition to Versailles also equalled opposition to the Weimar Republic. Finally, Evans argued that it is untrue that Versailles caused the premature end of the Republic, instead contending that it was the Great Depression of the early 1930s that put an end to German democracy. He also argued that Versailles was not the "main cause" of National Socialism and the German economy was "only marginally influenced by the impact of reparations". Ewa Thompson points out that the treaty allowed numerous nations in Central and Eastern Europe to liberate themselves from oppressive German rule, a fact that is often neglected by Western historiography, more interested in understanding the German point of view. In nations that found themselves free as the result of the treaty—such as Poles or Czechs—it is seen as a symbol of recognition of wrongs committed against small nations by their much larger aggressive neighbours. Regardless of modern strategic or economic analysis, resentment caused by the treaty sowed fertile psychological ground for the eventual rise of the Nazi Party. The German historian Detlev Peukert wrote that Versailles was far from the impossible peace that most Germans claimed it was during the interwar period, and though not without flaws was actually quite reasonable to Germany. Rather, Peukert argued that it was widely believed in Germany that Versailles was a totally unreasonable treaty, and it was this "perception" rather than the "reality" of the Versailles treaty that mattered. Peukert noted that because of the "millenarian hopes" created in Germany during World War I when for a time it appeared that Germany was on the verge of conquering all of Europe, any peace treaty the Allies of World War I imposed on the defeated German Reich were bound to create a nationalist backlash, and there was nothing the Allies could have done to avoid that backlash. Having noted that much, Peukert commented that the policy of rapprochement with the Western powers that Gustav Stresemann carried out between 1923 and 1929 were constructive policies that might have allowed Germany to play a more positive role in Europe, and that it was not true that German democracy was doomed to die in 1919 because of Versailles. Finally, Peukert argued that it was the Great Depression and the turn to a nationalist policy of autarky within Germany at the same time that finished off the Weimar Republic, not the Treaty of Versailles. French historian Raymond Cartier states that millions of Germans in the Sudetenland and in Posen-West Prussia were placed under foreign rule in a hostile environment, where harassment and violation of rights by authorities are documented. Cartier asserts that, out of 1,058,000 Germans in Posen-West Prussia in 1921, 758,867 fled their homelands within five years due to Polish harassment. In 1926, the Polish Ministry of the Interior estimated the remaining number of Germans at fewer than 300,000. These sharpening ethnic conflicts would lead to public demands to reattach the annexed territory in 1938 and become a pretext for Hitler's annexations of Czechoslovakia and parts of Poland. The plebiscites initiated due to the treaty have drawn much comment. Historian Robert Peckham wrote that the issue of Schleswig "was premised on a gross simplification of the region's history. ... Versailles ignored any possibility of there being a third way: the kind of compact represented by the Swiss Federation; a bilingual or even trilingual Schleswig-Holsteinian state" or other options such as "a Schleswigian state in a loose confederation with Denmark or Germany, or an autonomous region under the protection of the League of Nations." In regards to the East Prussia plebiscite, historian Richard Blanke wrote that "no other contested ethnic group has ever, under un-coerced conditions, issued so one-sided a statement of its national preference". Richard Debo wrote "both Berlin and Warsaw believed the Soviet invasion of Poland had influenced the East Prussian plebiscites. Poland appeared so close to collapse that even Polish voters had cast their ballots for Germany". In regards to the Silesian plebiscite, Blanke observed "given that the electorate was at least 60% Polish-speaking, this means that about one 'Pole' in three voted for Germany" and "most Polish observers and historians" have concluded that the outcome of plebiscite was due to "unfair German advantages of incumbency and socio-economic position". Blanke alleged "coercion of various kinds even in the face of an allied occupation regime" occurred, and that Germany granted votes to those "who had been born in Upper Silesia but no longer resided there". Blanke concluded that despite these protests "there is plenty of other evidence, including Reichstag election results both before and after 1921 and the large-scale emigration of Polish-speaking Upper Silesians to Germany after 1945, that their identification with Germany in 1921 was neither exceptional nor temporary" and "here was a large population of Germans and Poles—not coincidentally, of the same Catholic religion—that not only shared the same living space but also came in many cases to see themselves as members of the same national community". Prince Eustachy Sapieha, the Polish Minister of Foreign Affairs, alleged that Soviet Russia "appeared to be intentionally delaying negotiations" to end the Polish-Soviet War "with the object of influencing the Upper Silesian plebiscite". Once the region was partitioned, both "Germany and Poland attempted to 'cleanse' their shares of Upper Silesia" via oppression resulting in Germans migrating to Germany and Poles migrating to Poland. Despite the oppression and migration, Opole Silesia "remained ethnically mixed." Frank Russell wrote that, in regards to the Saar plebiscite, the inhabitants "were not terrorized at the polls" and the "totalitarian [Nazi] German regime was not distasteful to most of the Saar inhabitants and that they preferred it even to an efficient, economical, and benevolent international rule." When the outcome of the vote became known, 4,100 (including 800 refugees who had previously fled Germany) residents fled over the border into France. During the formulation of the treaty, the British wanted Germany to abolish conscription but be allowed to maintain a volunteer Army. The French wanted Germany to maintain a conscript army of up to 200,000 men in order to justify their own maintenance of a similar force. Thus the treaty's allowance of 100,000 volunteers was a compromise between the British and French positions. Germany, on the other hand, saw the terms as leaving them defenseless against any potential enemy. Bernadotte Everly Schmitt wrote that "there is no reason to believe that the Allied governments were insincere when they stated at the beginning of Part V of the Treaty ... that in order to facilitate a general reduction of the armament of all nations, Germany was to be required to disarm first." A lack of American ratification of the treaty or joining the League of Nations left France unwilling to disarm, which resulted in a German unwillingness to rearm. Schmitt argued "had the four Allies remained united, they could have forced Germany really to disarm, and the German will and capacity to resist other provisions of the treaty would have correspondingly diminished." Max Hantke and Mark Spoerer wrote "military and economic historians [have] found that the German military only insignificantly exceeded the limits" of the treaty prior to 1933. Adam Tooze concurred, and wrote "To put this in perspective, annual military spending by the Weimar Republic was counted not in the billions but in the hundreds of millions of Reichsmarks"; for example, the Weimar Republic's 1931 program of 480 million Reichsmarks over five years compared to the Nazi Government's 1933 plan to spend 4.4 billion Reichsmarks per year. P.M.H. Bell argued that the British Government was aware of latter Weimar rearming, and lent public respectability to the German efforts by not opposing them. Norman Davies wrote that "a curious oversight" of the military restrictions were that they "did not include rockets in its list of prohibited weapons", which provided Wernher von Braun an area to research within eventually resulting in "his break [that] came in 1943" leading to the development of the V-2 rocket. ^ see the Reparations section. ^ Similar wording was used in the treaties signed by the other defeated nations of the Central Powers. Article 117 of the Treaty of Saint-Germain-en-Laye with Austria, Article 161 of the Treaty of Trianon with Hungary, Article 121 of the Treaty Areas of Neuilly-sur-Seine with Bulgaria and Article 231 of the Treaty of Sevres with Turkey. ^ see The Treaty of Saint-Germain-en-Laye, The Treaty of Trianon, The Treaty of Neuilly, and The Treaty of Sèvres. ^ On 8 March 1936, 22,700 armed policemen were incorporated into the army in 21 infantry battalions. ^ Gustav Krupp later claimed he had duped the Allies throughout the 1920s and prepared the German military for the future. ^ Treaty of Saint-Germain-en-Laye (1919) with Austria; Treaty of Neuilly-sur-Seine with Bulgaria; Treaty of Trianon with Hungary; Treaty of Sèvres with the Ottoman Empire; Davis, Robert T., ed. (2010). U.S. Foreign Policy and National Security: Chronology and Index for the 20th Century. 1. Santa Barbara, California: Praeger Security International. p. 49. ISBN 978-0-313-38385-4. ^ Tucker & Roberts 2005, pp. xxv, 9. ^ Tucker & Roberts 2005, p. 1078. ^ Andrew Wiest, The Western Front 1917–1918: From Vimy Ridge to Amiens and the Armistice (2012) pp 126, 168, 200. ^ "Why was the Zimmermann Telegram important?". BBC History Magazine. 17 January 2017. Retrieved 11 January 2019. ^ Tucker & Roberts 2005a, pp. 429. ^ John Milton Cooper (2011). Woodrow Wilson: A Biography. Vintage. pp. 422–424. ^ a b Tucker & Roberts 2005a, p. 225. ^ Tucker & Roberts 2005a, p. 638. ^ Lentin, Antony (1985) . Guilt at Versailles: Lloyd George and the Pre-history of Appeasement. Routledge. p. 84. ISBN 978-0-416-41130-0. ^ Lentin 2012, p. 22. ^ Lentin 2012, p. 21. ^ Keylor, William R. (1998). The Legacy of the Great War: Peacemaking, 1919. Boston and New York: Houghton Mifflin. p. 34. ISBN 0-669-41711-4. ^ a b David Thomson, Europe Since Napoleon. Penguin Books. 1970, p. 605. ^ Cite error: The named reference Frucht24 was invoked but never defined (see the help page). ^ Tucker & Roberts 2005a, p. 437. ^ Tucker & Roberts 2005a, p. 1224. ^ Treaty of Versailles, Articles 165, 170, 171, 172, 198 and tables No. II and III. ^ a b Lentin 2012, p. 26. ^ Tucker & Roberts 2005a, p. 426. ^ a b R. Henig, Versailles and After: 1919–1933 (London: Routledge, 1995) p. 52. ^ Filipe Ribeiro de Meneses, Post-war Settlement (Portugal) in: 1914–1918-online. International Encyclopedia of the First World War, ed. by Ute Daniel, Peter Gatrell, Oliver Janz, Heather Jones, Jennifer Keene, Alan Kramer, and Bill Nasson, issued by Freie Universität Berlin, Berlin 2014-12-18. ^ President Woodrow Wilson speaking on the League of Nations to a luncheon audience in Portland OR. 66th Cong., 1st sess. Senate Documents: Addresses of President Wilson (May–November 1919), vol. 11, no. 120, p. 206. ^ Duff, John B. (1968). "The Versailles Treaty and the Irish-Americans". Journal of American History. 55 (3): 582–598. doi:10.2307/1891015. JSTOR 1891015. ^ Wimer, Kurt; Wimer, Sarah (1967). "The Harding Administration, the League of Nations, and the Separate Peace Treaty". The Review of Politics. Cambridge University Press. 29 (1): 13–24. doi:10.1017/S0034670500023706. JSTOR 1405810. ^ Lauteinann, Geschichten in Quellen Bd. 6, S. 129. ^ Marks 1978, pp. 236–237. ^ Ferguson 1998, p. 414. ^ Marks 1978, pp. 223–234. ^ Kramer 2008, p. 10. ^ Martel 2010, p. 156. ^ Tucker & Roberts 2005a, p. 967. ^ Fischer, Klaus (1995). Nazi Germany: A New History, p. 408. ^ Stevenson 1998, p. 11. ^ Markwell, Donald (2006). John Maynard Keynes and International Relations: Economic Paths to War and Peace. Oxford University Press. ^ Keynes (1919). The Economic Consequences of the Peace. Ch VI. The Treaty includes no provisions for the economic rehabilitation of Europe—nothing to make the defeated Central Empires into good neighbours, nothing to stabilize the new States of Europe, nothing to reclaim Russia; nor does it promote in any way a compact of economic solidarity amongst the Allies themselves; no arrangement was reached at Paris for restoring the disordered finances of France and Italy, or to adjust the systems of the Old World and the New. The Council of Four paid no attention to these issues, being preoccupied with others—Clemenceau to crush the economic life of his enemy, Lloyd George to do a deal and bring home something which would pass muster for a week, the President to do nothing that was not just and right. It is an extraordinary fact that the fundamental economic problems of a Europe starving and disintegrating before their eyes, was the one question in which it was impossible to arouse the interest of the Four. Reparation was their main excursion into the economic field, and they settled it as a problem of theology, of polities, of electoral chicane, from every point of view except that of the economic future of the States whose destiny they were handling. ^ Hantke, Max; Spoerer, Mark (2010). "The imposed gift of Versailles: the fiscal effects of restricting the size of Germany's armed forces, 1924–9" (PDF). Economic History Review. 63 (4): 849–864. doi:10.1111/j.1468-0289.2009.00512.x. Archived from the original (PDF) on 27 October 2011. ^ Reynolds, David. (20 February 1994). "Over There, and There, and There." Review of: "A World at Arms: A Global History of World War II," by Gerhard L. Weinberg. New York: Cambridge University Press. ^ Weinberg, Gerhard Germany, Hitler and World War II, Cambridge: Cambridge University Press, 1995, p. 16. ^ Correlli Barnett, The Collapse of British Power (London: Pan, 2002), p. 392. ^ a b c d Evans, Richard In Hitler's Shadow, New York: Panatheon 1989, p. 107. ^ a b c d e Peukert, Detlev The Weimar Republic, New York: Hill & Wang, 1992 p. 278. Stevenson, David (1998). "France at the Paris Peace Conference: Addressing the Dilemmas of Security". In Robert W.D. Boyce (ed.). French Foreign and Defence Policy, 1918–1940: The Decline and Fall of a Great Power. London: Routledge. ISBN 978-0-415-15039-2. Wikimedia Commons has media related to Treaty of Versailles.